USA BABY! We are a lil' business that loves supporting other lil' U.S. based businesses; each one doing something awesome! From Michigan steel mills, to US forests, & Mom & Pop cabinet shops in Texas, we're loyal to our country & want to be the fuel that supports American business and manufacturing. 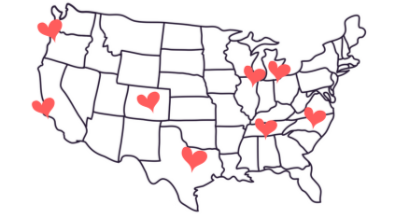 Each heart on the map represents another US business we love and support through our purchases at Cozy Cama. It takes businesses to make businesses & and we've got the right stuff (right here) in the U.S.A., baby. A BED FOR A BED: You can have beautiful things and do beautiful things through our partnership with Sweet Sleep! 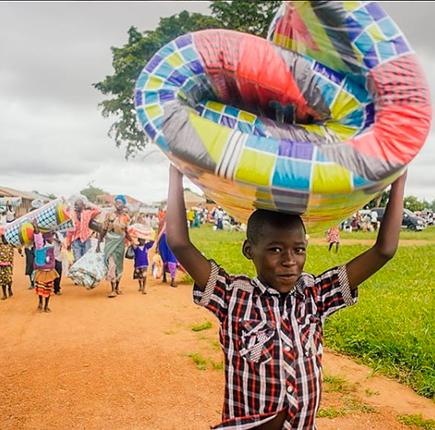 With each pet bed sold on our site, we purchase a bed & mosquito net for a child in need somewhere in the world. In addition to beds, sweet sleeps invests time and energy into economic development plans to break the cycle of poverty in the areas they serve. At Cozy Cama, we love pets, and we love humans, too. We're just full of love round' here & we're passionate about giving hope and comfort to those in need. Just imagine, as your sweet dog sleeps soundly with Cozy Cama, so does a child somewhere in the world. LESS WASTE & MONEY SAVED: Less is more. Quality over quantity. Fight the Fugly. However you want to say it, we all can agree these beds STINK. These mass-manufactured fiber-filled floor cushions cannot withstand the love your pet throws at them. They wear out. We toss them. We buy another. And Repeat. Repeat. Repeat. That's your $$$ into a landfill, essentially. EARTH IS OUR BFF: We looooooove Earth work hard to be responsible and careful with our planets' precious resources. 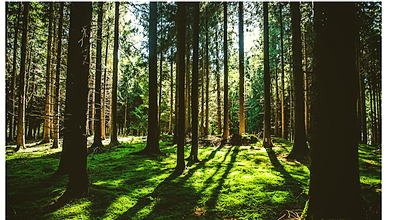 We're into non-toxic finishes, recycled/organic fabrics, natural materials that are responsibly managed, soy-based adhesives, and eco-friendly packaging. We're really done the research on our materials. Did you know Asian insects help us make our furniture durable and shiny? We use a finish called shellac and it's made with the help of the friendly lac bug. Nature is awesome, and amazing, you guys. CATS LOVE US TOO: Cozy Cama isn't just for dogs. We love all the gatos out there looking for a purrfect place to relax and bask in the elegance and intelligence that is the feline existence. We're quite confident cats consider these beds personal thrones...and we love it! Hello, I'm Evan. And that's Leroy. And we're so happy to e-meet you. We want you to know Cozy Cama exists to satisfy a longing we all have for smart, sustainable & attractive items in our homes for our pets. 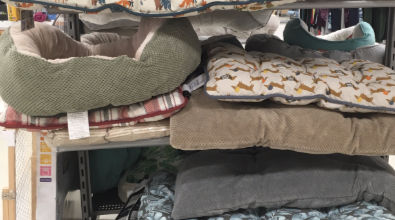 A quick stroll down the bedding aisle in any pet store can instantly remind us of the things we don't want in our world (and our home): mass manufactured products inexpensively produced with little regard for durability, washability, or the environment. Here, we design & thoughtfully build wooden pet furniture sized to fit human pillows because, quite simply, it just makes life a bit more easy. And a bit more smelly. For your dog. In the best way possible. And, I mean, really, who wants to deal with unstuffing and restuffing a "*%$#" dog bed on a beautiful Saturday. Wouldn't you rather be outside playing fetch? At a park? With your dog friends? Dog bedding really can be as simple as washing a pillow sham. It really can look amazing in your home. And, a dog bed really can last lifetime. We're taking quality back. Sorry China. Questions, Comments, Concerns, Funny Stories? Choose a method below and let's talk!